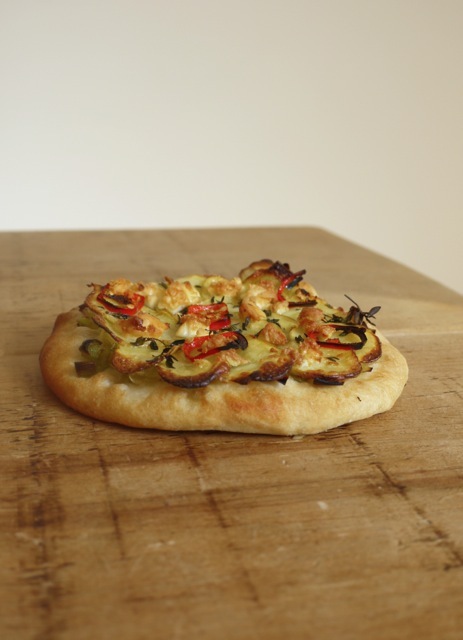 Oct-01-2015 37 Comments on Leek & Potato Pizzette + News! The morning after the launch party for my cookbook, back in June, I woke up early with a racing heart, a slight sicky feeling and butterflies in my stomach. Given the gallons of prosecco that were consumed the night before, this shouldn’t have been surprising. Except that I hadn’t been drinking. Twenty one weeks later and it’s about time I shared some important news with you. I think you might guess where I’m going with this . . .
I’m pregnant! We’re pregnant, I suppose, but mine is the slowly expanding waistline just starting to betray the presence of this baby bun in the oven. I’m no longer the littlest loaf in our household and I – we, our families and friends – couldn’t be more over the moon and in love. I’ve always wanted to be a mummy in an abstract sort of a way, but now it’s actually happening it feels so right and so real, so incredibly exciting yet scary, so completely life-changing but also just the natural progression of things. I’m making this new life with the man I love more than anything in the world and I can’t wait to see him be a father, to both be parents, to share our imperfect, happy, strange and silly lives with this precious little person inside me. I’ve been wanting to write this post for a while now. In fact, I had started to write it – in my head at least – in December last year, but the absence of a newborn baby in our lives goes some way to explaining what happened to that. Miscarriage, I’ve since been told, will happen to one in four women in their life – that’s a pretty hefty percentage – but somehow it’s still this strange taboo subject, swathed in the mystery of those secret first three months and so often dealt with privately. I was lucky enough to have the support of an incredible network of family and friends at the time, but reading posts by Heather, Madison, Shanna and other blogger ladies brave enough to share their stories in public has convinced me that it’s something worth just touching on here. If miscarriage is something you or a loved one know all too well about (which, statistically, is pretty damn likely), know that I truly understand at least some of that grief, that there’s light at the end of a very dark tunnel and that life, quite literally, does go on. Having said that, we’re not quite out of the woods yet (it never rains but it pours). At our 20 week scan our brilliant nurse spotted something slightly wrong with our little boy’s (he’s a boy!) heart. He was curled up with his arm over his chest making it tricky to get one particular view and she could so easily have given us the all clear based on all his other measurements and organs. But she persisted and although no new parent – any parent at all – wants to hear that their baby, or child, is anything less than perfect, after follow up scans and cardiac appointments, lots of talking and even more tears, we’re at a place where we know there’s a solution. Our baby boy will have an operation as soon as he’s born, there’s an extremely high survival rate and he should go on to live a long and healthy life. Whatever its flaws, the NHS is a very brilliant thing. As for me, it’s as if I’ve grown up about five years in the last five days. I’m quickly learning that this parenthood thing turns everything on its head and my feelings suddenly seem secondary to this primal, overriding urge to protect my baby. It’s simple enough now as what’s mine is his at this stage in our lives, so looking out for myself takes care of the two of us. Food-wise this has involved a varied and vegetable filled diet: I’ve (shhh) significantly lost my sweet tooth and indulgences have increasingly taken the form of salty snacks, marmite on toast and a powerlessness to resist beef mince in any form (this is totally out of character for me and provided an early clue as to our baby boy’s gender long before he made himself known to the ultrasound scanner!). When he’s not tempting me to eat meat – something I’m sure he’ll continue to do in cahoots with Carnivorous Husband once he’s born, grown and able to speak – our baby boy seems to be a big fan of anything carbohydrate based and salty, so these pizzette are a celebration of that. A crispy homemade base, thinly sliced potato for starch on starch goodness, melting leeks and nuggets of feta for the perfect salty finish. So there you have it – exciting, terrifying, life changing stuff, which is exactly how I expected pregnancy to be. Perhaps without the major surgery at the end of it, and if I could magic our baby boy better of course I would, but this is part of his life story now and what makes him so very extra special. Here’s to health and happiness, salty carbohydrates and – when he arrives in February next year – what I’m fully expecting to be the very best thing I’ll ever bake. 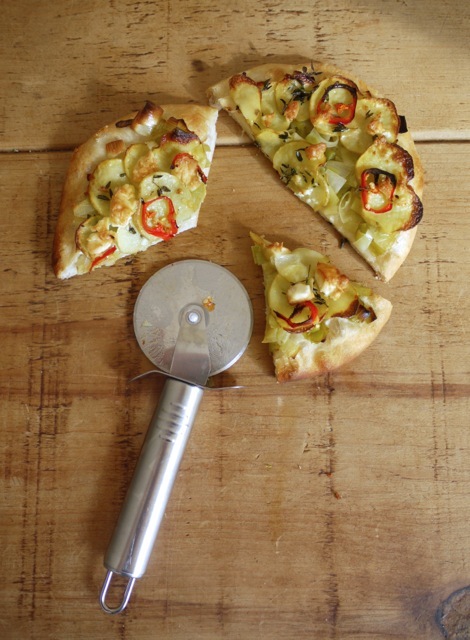 Crisp mini pizzas with soft slices of potato, melting leeks, a kick of chilli and salty nuggets of cheese. Makes 10 - 12 pizzette. 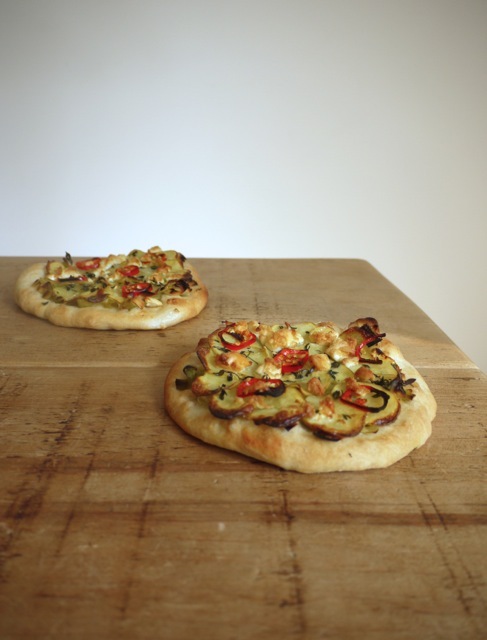 Preheat the oven to 220 degrees C and place two pizza stones or baking trays inside to heat up. 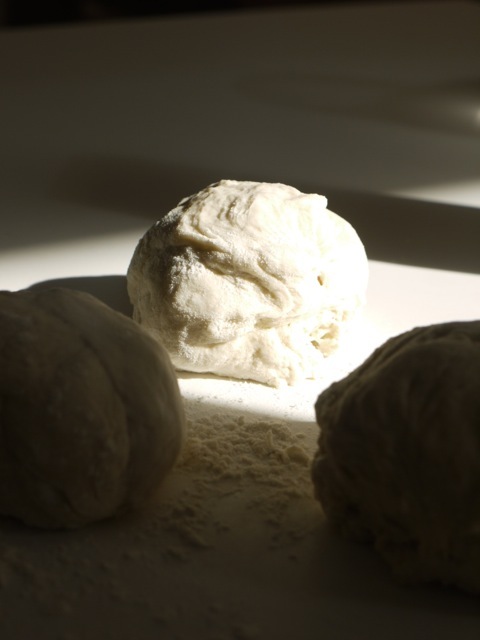 Divide your dough into 10 - 12 equal balls, depending how big you'd like your pizza. On a lightly floured work surface, roll each ball out to about 0.5cm thick. In a medium saucepan, heat the oil and butter until the butter has melted. Add the leeks and cook gently until soft and melting, around 10 minutes. Allow to cool slightly. Toss the potato slices with the thyme and salt. Divide the leek mixture over the pizza bases. Top with slices of potato and sprinkle with chilli. 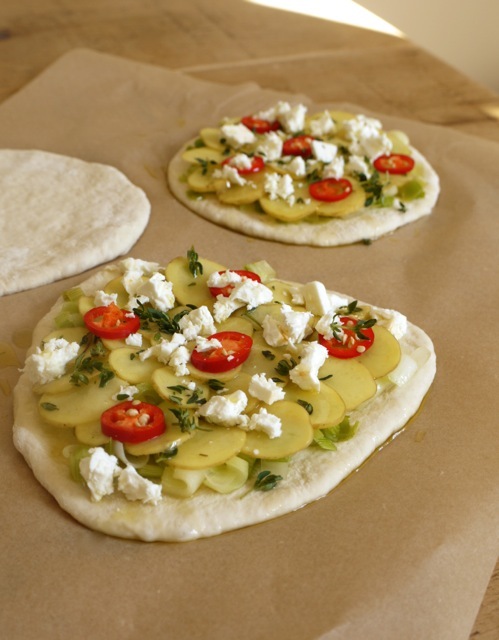 Crumble over the feta then transfer the pizzette to your pizza stone and bake for 10 - 15 minutes or until crisp and risen at the edges. Allow to cool slightly, then serve. These pizzette can be topped with all manner of treats and are best eaten on the day of making. 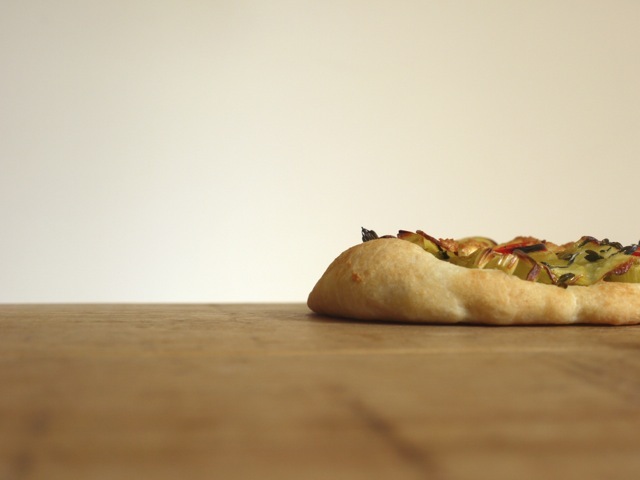 37 RESPONSES TO Leek & Potato Pizzette + News! That’s such lovely news, written as usual in a beautiful way – congratulations to you and your family and well done for also touching on a difficult subject. Very best wishes to you! What a beautiful and touching post. The NHS are truly marvelous when it comes to ‘little people’, I couldn’t agree more. So funny hearing about the taste changes, I was the same, one blue boy later and he still is ‘savoury’ headstrong and barely touches the sweet stuff, the pink lassie is the polar opposite from the earliest of days my pregnancy was all about puddings ! Nothing’s changed now, 4 years on and she can smell a chocolate a mile away. Happy days. Eat well, keep well and sleep till February ! Many congratulations. I’m also one of those 1in4 woman. I wish you all the best for the future. Congratulations! I can’t imagine how emotionally stressful it has been, but I’m glad it sounds like all will be ok! A baby bun! Oh congratulations -wishing you all the very best. All three of you. Congratulations! Such a scary and exciting time. I have an 18 month old, and before she was born I also had a miscarriage – a missed one at 9 weeks, three month before she was conceived. Oh my goodness, CONGRATS!! So so happy for you, Kate. Sending you thoughts and wishes for a super safe and smooth rest of your pregnancy! 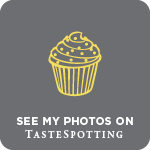 I am loving that photo of the pizza dough! This flavor combo – so good. Sending so much love your way, girl!! Congratulations!! Just a few months, eeek, I’m SO excited! What a beautiful pie and congratulations. One book I recommend to all new mommies to be is Back Labor No More by Janie McCoy King. Order it today…I kid you not this is a must read. I did her “lift” with two of the three of my births and I wish I new this miracle lift for the first one! Remember to be in the place you want to be for the birth before you lift and if the baby is in the right position you will see him immediately. Thank you Ashlae, and yes, potato pizza is the way forward! Massive congratulations Kate! And yes, thank goodness for our wonderful NHS – i’m sure they’ll take excellent care of your little boy. And thank you for sharing your miscarriage story – it is very brave and very necessary that people are more open about it – I think it really helps women feel less alone when it happens to them. Wow, Kate! What wonderful news!!!!! I’m so sorry for your previous loss but now I am glad that you are on your way to a healthy baby (thank goodness for good doctors!). And having a baby boy is pretty much the best thing ever so I am so excited for you! Congratulations! Having a baby growing inside is a miracle. Enjoy every moment! Xo. Dear Kate, what wonderful news, congratulations! I am so happy for you. Luckily in this day and age we are very lucky and medicine truly is miraculous, so have faith and keep your calm. You are finding out very soon, unfortunately, the utter joy yet pain/fear being a parent goes hand in hand with. But it seems from your words that you understand what is happening and know how to deal with it. You already sound like a fabulous Mum! PS your chocolate/caramel tarts are one of my absolute faves at Xmas time! Ah thank you so much, it’s so reassuring to hear stories like this from people 🙂 and so glad you like the tarts!